When was the last time you had a conversation with a stranger? If you’re like most of us, you probably had to think for a bit to come up with an answer. When you live in a big city like Houston or Los Angeles, it can be hard to start conversations with people you don’t already know, even when they’re officemates or people out walking their dogs on the street that you see every day. 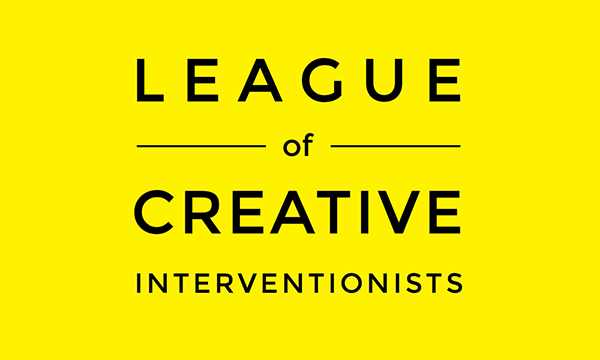 That’s where The League of Creative Interventionists comes in. How does it work? The League selects a common theme each month—with Halloween, October’s, appropriately, is “fear”—that its local chapters interpret and develop into projects called “interventions.” Set in public spaces, the events invite spontaneous participation from curious passerby, and everyone is invited to join in, make art and meet new people. The San Francisco event was a success, and the League has been met with similarly positive reception worldwide. 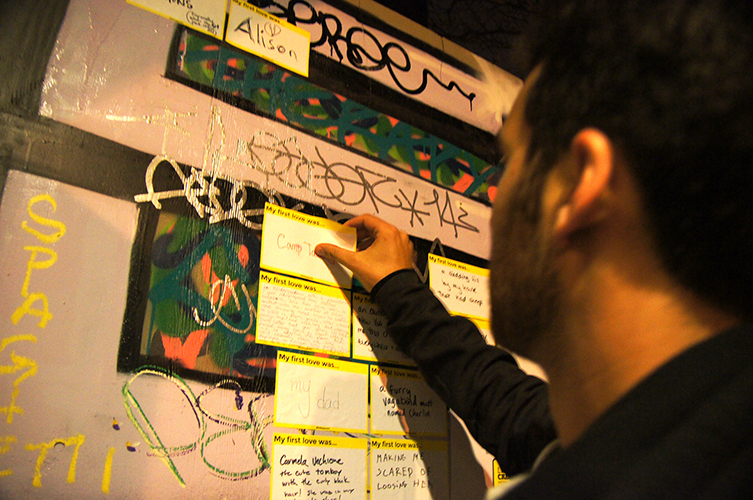 In less than a year, the League has already expanded into a global network with branches in Peru, Germany, England, and across the U.S. Other interventions have included a pop up karaoke booth, a post-it note gallery on a bus stop, and a “slow lane” intended to get busy city dwellers to relax. One thing that makes League interventions so successful is that they often don’t require complexity to succeed. 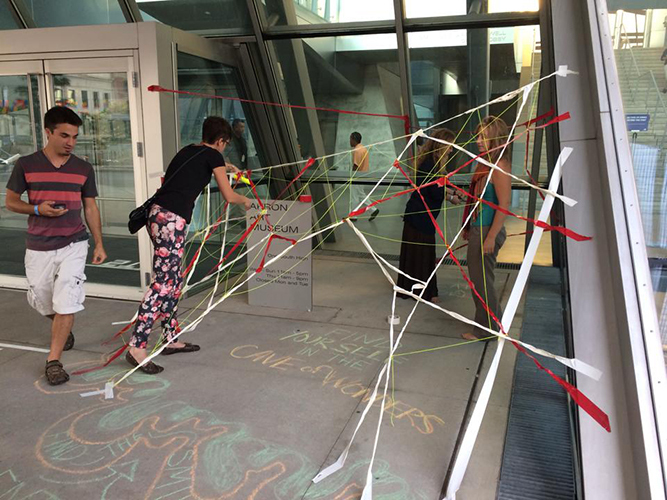 In August, Akron, Ohio’s chapter organized an informal sidewalk party (theme: health), where attendees created chalk drawings, crafted caves made of yarn, and even organized games of hopscotch. In the bustle of a big city, the appeal of these games, with their callbacks to the simplicity of childhood, is obvious. But according to Franks, even if it’s activities that initially draw people in, what make interventions most memorable for him are actually the participants. Along with chalk art, “caves” made of duct tape and yarn helped attract curious passerby in Akron. The League’s ultimate takeaway? Talking to strangers might seem awkward or difficult or silly, but it doesn’t have to be. Sometimes it can take a little push—like a fun art activity or concert—but you end up making lifelong friends and building stronger communities. From Franks comes this gentle reminder: everyone you knew was once a stranger, so why be afraid to make connections? All you need to do is start small. This entry was posted in Arts Access, Placemaking and tagged arts, arts access, creative placemaking, Hunter Franks, Placemaking, The League of Creative Interventionists on October 10, 2014 by Katie Huang.